Wells is a charming little West Country city with a magnificent cathedral and an ancient Bishop's Palace. Its name is taken from the three ancient wells that exist in the area. The Romans had a small settlement here but little of importance until the Saxon King Ine of Wessex founded a minster church in 704 AD. The settlement then grew in stature until two hundred years later the town became the seat of a local bishop. In 1088, however, the bishopric was moved to Bath. The canons of Wells were obviously not pleased by this and there was considerable local agitation until the diocese was renamed as the Diocese of Bath and Wells. Bishop Robert granted its first charter in 1160 and in 1205 Wells gained city status. During the Middle Ages Wells became a textile manufacturing and trading centre. Today, Wells retains many of its historic buildings and its ecclesiastical atmosphere, and lives on mainly through the tourist trade. Vicars' Close is said to be the oldest residential street in Europe. The Close tapers-in by 10 feet (3.0 m) to make it look longer when viewed from the bottom and shorter when viewed from the top. The Old Deanery dates from the 12th-century and St John's Priory from the 14th. The Church of St Cuthbert has a fine stone tower and a superbly carved roof. It started life as a 13th-c. building but was updated in the 15th-c.
Wells also has some old fine schools. Wells Cathedral School, founded in 909, is a private school with a Christian flavour and is one of five schools established to offer children a musical education. The Blue School, founded in 1654, is now a state comprehensive with a particular interest in science education. 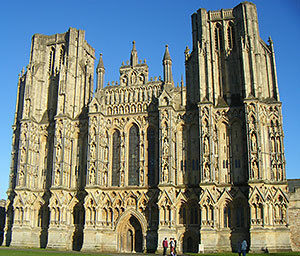 Although Wells is one of Britain's smallest cities, it boasts one of its most finest cathedrals. The magnificent building that dominates the city began in the late 12th-c., after the Bishop of Bath transferred his headquarters there. Parts of this venerable old building may date back even further to the 10th-c. The main building has very fine vaulted ceilings and unusual scissor arches supporting the central tower. 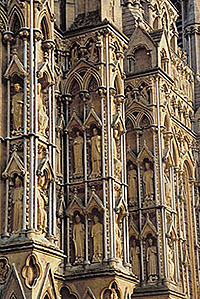 The 13th-c. west front was erected as a backdrop for around 400 statues of saints, angels and prophets, carved from the cathedral's light yellow stone (as shown in the image right). Most of these survive to this day, but sadly around 100 were destroyed by Puritans in the 17th century. The 24 hour astronomical clock, located in the north transept, was constructed in 1392, and is one of the oldest working clocks in the world. It has a dial more than 6 ft across, with moving models of knights that joust on the quarter-hour. The fortified, moat-ringed Bishop's Palace, lies to the south of the cathedral. It is one of the oldest inhabited houses in England, where bishops have lived for over 800 years. 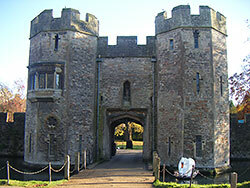 Its outer walls date back to 1206. A medieval gateway with portcullis and drawbridge, called the Bishop's Eye, straddles the approach to the 14th-c. ruined Great Hall and bishop's private chapel. Occasionally the swans on the moat ring a bell by the bridge for food, as their ancestors were taught to do by a Victorian bishop's daughter. Outside there are 14 acres of gardens that house two of the springs from which the city takes its name.